Hello to you! Hope your Summer is going well so far. This week, I decide to give my living room a new summery look, complete with bright whites, a few vintage elements and fresh flowers. I started with some rearranging…swapping the porch furniture with the living room furniture. The living room is directly in front of you when you walk in the front door and I wanted it to feel nice and welcoming. I washed all my slipcovers, which was quite the chore due to my crappy washing machine, then after finally getting the furniture all put back together, I added a little vintage stool as a side table and a few old books. And, of course, no makeover is complete without the addition of flowers. My lovely neighbor gave my these pretty pink peonies with instructions to take as many as I want. How great is that? I managed to contain my glee and greediness and only took a few. I kept thinking about the other possible decorating options for this room and wondered how a bench would look in front of the couch. So, I got one out and added a few flowers and some old canning jars to help liven it up a bit. I liked it, but I think I’d prefer a rustic side table instead…maybe something with metal. Another idea that came to mind was logs. We have these huge peeled logs in the garage and I’m wondering if perhaps the Mister would be willing to cut the end off of one for a little table. Oh, I think that would look good! Those things cost a small fortune though, so I don’t know if he’ll go for that idea. There ya go sweet peeps…my summerfied living room. Well, all this talk has me hungry…I think I hear some strawberries calling my name. Hope you’re having a wonderfully sunny week. Your home is so lovely – I love the soft tones, your furniture and the light…oh that glorious light! Is the rug from PB? I have debating whether to get one, does it wear well? Your living room is beautiful. The white, the flowers, the wall color . . .lets just say I love it all. I think the bench looks great. But what wouldn't with canning jars and flowers resting on it LOL! Your chair looks like a lovely peaceful spot. The pale pink flowers with the white and seagrass is particularly pretty. As usual, it is your photos that captivate me. GORGEOUS. so beautiful and peaceful. i need a spot like that right around now! Soo soo gorgeous Tricia!! I love your pretty serene living room! The bench is so charming with your glass bottles~ and those peonies! Oh my! I was on a quest yesterday for some peonies and 3 stores later- NONE! I had to switch to another flower. I am so ready to change all my living room decor around… again… too! Beautiful! I love the peonies. I think the bench looks very nice in front of the couch! Oh, and you have some amazing windows! What beautiful, peaceful pictures! Love the flowers in the vases all lined up. I like the layout and simplicity of your blog. Did you set it up yourself? i am playing around with my blog backgrounds etc….can you offer any help 😉 Thanks so much. Oh Tricia, every time you show me a new room in your home, I fall more in love! Your home is so beautiful! I do love the bench with added flowers to your mason jars. How beautiful!! I love that chair and ottoman and the stool and bench add a nice farmhouse look. Love peonies. They looks so pretty arranged in a vase. Great job, Tricia! Your home looks like it just came out of a magazine! …Let's not forget the smootie on the coffee table! …love, Love, LOVE the bench with all those lovely lilacs!! Your living room looks gorgeous! 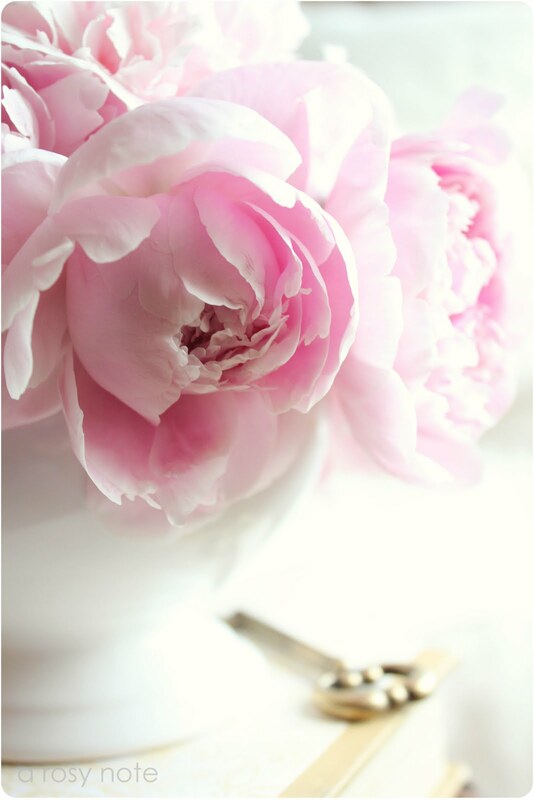 Peonies are an absolute favorite! I immediately noticed your armoire as I'm on the hunt for one myself. I love yours and the colour! Oh I love it! The bench, swoon! I'm "pinning" these photos for inspiration! Well your living room looks much prettier than mine. I should have waited till after I was my slipcovers to photograph and post. I do love your cozy chair. And I really like the black armoir. I would like to have one like it one day…when we have wood floors. Beautiful! I love the bench in your living room. It looks fresh, cozy and stylish, if you ask me. I adore your table and the flowers… so pretty. I love your bright and airy style! Marvelous! BEAUTIFUL photos of your home. I just love it all!! Just beautiful, Tricia! The pale tones are so restful …but still elegant. The pink peonies look so wonderful in that setting. I have a similar pink one blooming right now, but I don't have an elegant setting for them. I'm so envious of the light you have in your home. 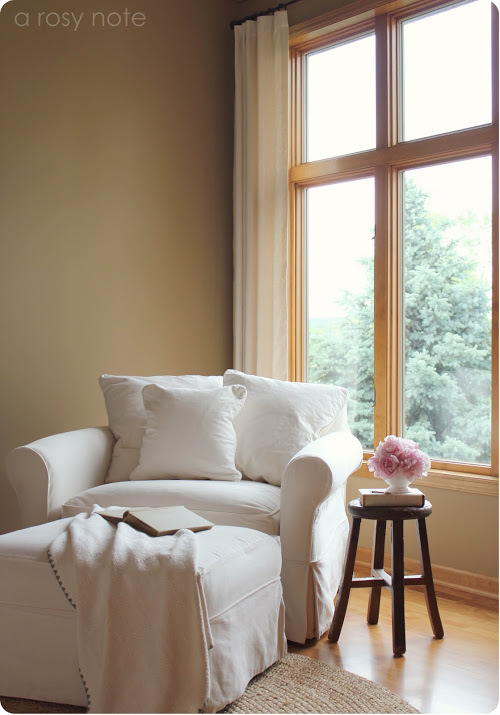 How peaceful and serene that chair in front of the window looks! I could see curling up there with a book and a cup of tea and not moving! I used a bench like that as a coffee table for many many years and loved it! I sits on my front porch now. Tricia, WOW!!!!! So elegant and lovely! Oh, Tricia! What a beautiful spot to relax! White slipcovers + pink peonies + aqua canning jars = PERFECTION! ♥ LUV!!!!! Your home is a dream! simply a dream! Dearest sweet tricia, your living room is so beautiful and i just love everything! 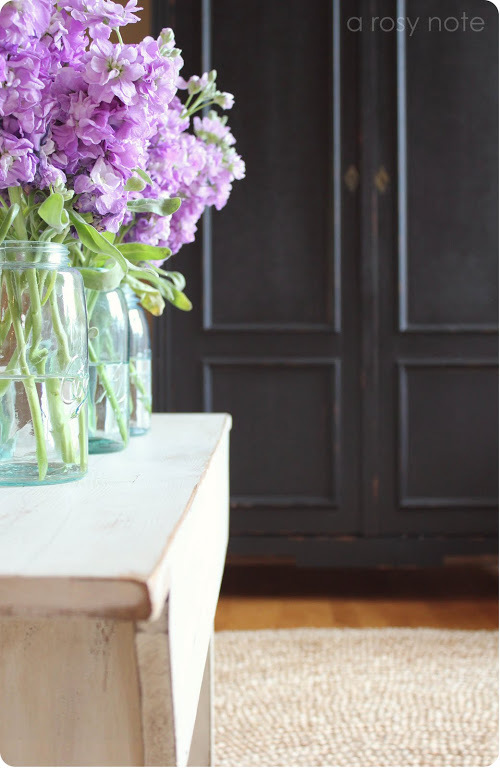 The flowers are gorgeous and they always add such beautiful touch to a room! Have a lovely merry happy friday and a wonderful weekend! Love to you! Lovely home, just gorgeous Tricia. I love the white and the light…! Just beautiful Tricia ~~ calming and clutter free! Everything is simply beautiful. I love the fact that you don't overdo anything. It is all just pefect. What a peaceful place to rest ones heart! Love the simplicity of your room, it truly takes my breath away!! I too have simply designs in a home of whites gray and natural driftwood tone. thank you so much for your lovely comment. I am so glad about it. Your home is so beautiful and look light and airy. I love the way how you decorate your home….in every detail. This bench is absolutly great! it suits perfectly to your lovely living room. Your blog is really an inspiration! Hi Tricia, I'm so glad you introduced yourself over at my blog so that I could find you! Oooh I love your home…..so beautiful! Wish I had a neighbour with peonies too! What a sepcial place in your home. Love the peonies. Such a lovely room — I like the table instead of the bench as well although the bench is pretty with the jars of flowers on it! Oh I could just curl up in that soft white chair with a hot cup of coffee and a good book! I would be there for hours! I'd just LOVE to curl up in your arm chair and have a lovely snooze!! Or maybe a little read. It looks SO welcoming, Tricia. 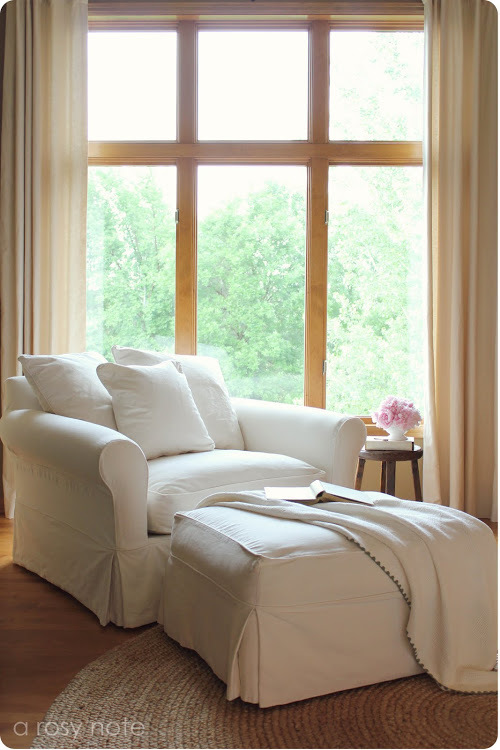 Big comfy white chair…how inviting! Looks so beautiful! How lovely! Beautiful home beautiful shots! What a pleasure to visit here! Love the new look, and the peonies are so pretty! Mine didn't bloom this year for some reason. 🙁 I am loving the bench with the vases of flowers too! Just looking at these photos makes me feel good. Love the lightness and airyness and serene tones! You DO take the most romantic photos I've ever seen! I love your pretty white decor. Your flowers look amazing next to the white backdrop. Looks lovely! Would love to sit in your white chair if only for a short while. Wish I had the energy and money to work on my house. 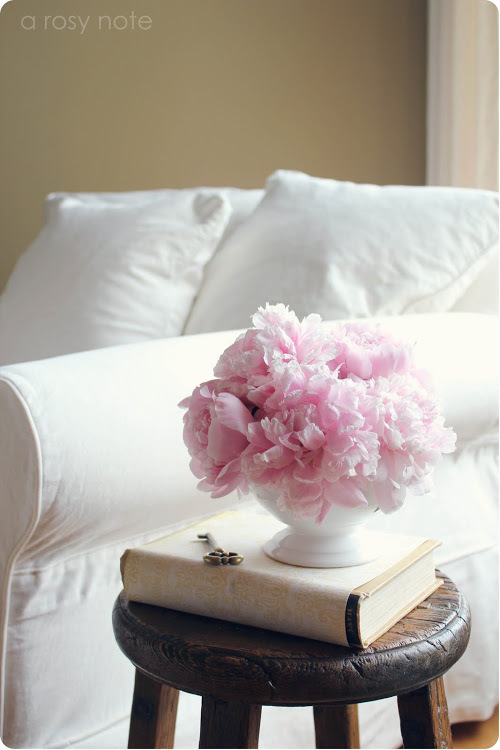 Peonies are one of my favorites,too! Love your beautiful decor…the couch and slip-covers so beautiful. The blooms and bench so striking together. That armoire..oooh-la-la! *Sigh* its all so beautiful.Gorgeous photography as well. Sat down to read through some blogs. The weather doesn't know what she will do. Love the photos…and the color scheme in your summer living room! What color is that on your walls? Oh…and do you make your own slipcovers? That chair looks so cozy… Love your photos. A lovely Zen-like atmosphere you have created… so inviting & serene! You have gorgeous photos of your lovely room. 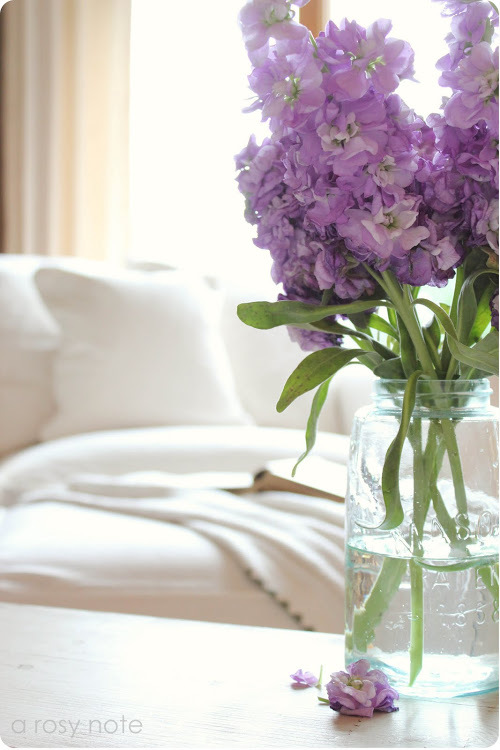 I really like the contrast of texture of the rug, rustic wood and white linens with flowers. Very pretty and such a relaxing look. Such wonderful light and tones in your home Tricia! Each is so perfectly composed. Gorgeous Tricia! Love the bench in front of the couch. Can't wait to see if you get the log you want cut. I have to ask though, what's it doing in the garage? Gosh, you take the prettiest pictures! Love the beautiful flowers… peonies are my favorite 🙂 Lovely living room! love the look of your room. I'm joining up as a follower so I can find my way back many times in the future. What a beautiful room! Lucky you! Those peonies are stunning and you are seriously talented. It looks so cool and inviting Tricia 🙂 Your images are beautiful! Your home looks so inviting and peacefully white. I love it. And how lucky you are to have a neighbor that gives you peonies! Tricia, where did you find the chair? It's incredible! Ohhh too divine for words!!!! Such a lovely room you have. The beautiful flowers gives more radiant inside. With a amazing natural light from the outside. Tricia, I just discovered your lovely blog. I love this room…so simple and cozy. I'm looking for an oversized reading chair for our bedroom. Where is your's from? I look forward to reading more from you! Your home is so beautiful and you display it very well on your blog. I love your home style and all the flowers. I hope to make my own blog as successful as your. Love the look! I have the same seat. Where are those pillows from? The pillows came with the chair, which is from Room and Board. wow… I really love your sofa!!!! So big and comfy. And I love your pictures too. Hello! I've had this furniture for many years and, sadly, Room and Board no longer carries anything of this style…they sell mostly midcentury modern pieces now. I love the look and feel of the room. Where did you purchase the slipcover from? The chair is from Room and Board. The slipcover came with it.